The imminent calving of ice shelf, Larsen C, will reduce Antarctica to its smallest ever size. Is global warming responsible? The first month of 2017 brought troubling news from the world’s southernmost landmass. Scientists warned that Larsen C, the fourth largest ice shelf in Antarctica, is on the verge of calving. A rift on the ice shelf has suddenly grown rapidly—by over 28 km in just one month. Once it extends by another 20 km and reaches the other end of the ice shelf, a giant section of the size of Bali would drift off the Antarctic Peninsula. This would cause the largest calving event, at least, since the 1980s. Researchers of Project MIDAS, a UK-based Antarctic research project, who have been tracking the progress of the rift for the past two years, say the break is immi nent. 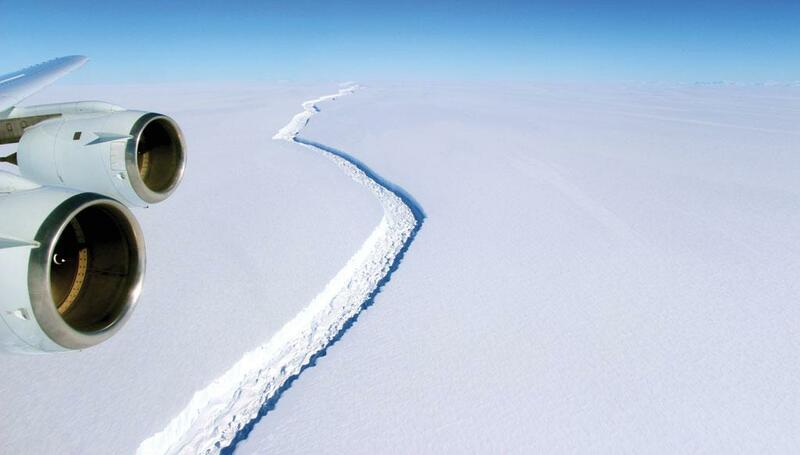 However, they say, it is not possible to predict when exactly the ice shelf will break off. “It depends on several factors, such as sea ice conditions in the frontal area of the ice shelf and downstream wind,” says Daniela Jansen, a researcher with MIDAS. The development has been on the hori zon for a while now. Unlike other cracks on ice shelves, which tend to stop at some point, the rift on Larsen C has been growing since it first appeared as a crack in the 1960s. The calving process has been particularly alar ming since 2014 (see ‘The crack just got bigger’,). Larsen C is becoming thinner and weaker due to the warming of atmosphere above and ocean waters below, warned the British Antarctic Survey in a 2015 paper published in The Cryosphere, a journal of the European Geosciences Union. Of late, several ice shelves on the west ern side of the continent are undergoing similar changes, and nearing calving points. These include Larsen C’s smaller northern neighbours, Larsen A and Larsen B, which calved in 1995 and 2002. The chunk that broke off from Larsen B was of the size of Goa and had existed for over 10,000 years. What is leading to such a dramatic collapse? And what would happen when these massive icebergs melt into the ocean? For this, let’s first understand what an ice shelf is, and what happens when it breaks off. Ice shelves are floating platforms of ice, usually hundreds of metres thick. They form as inland glaciers flow towards the coastline and onto the ocean surface. The sea ice at the frontal fringes of the shelves, also called passive frontal area, impede the flow from these glaciers and contribute to the growth of the ice shelf. So, when a portion from the frontal area breaks off, front of the ice shelf may become unstable, says Jansen. “That means there might be a transition from normal tabular calving of icebergs to a continuous small-scale calving, leading to a slow retreat of the front. In the case of Larsen B, the calving front retreated in that manner for several years. Before that large parts of the ice shelf had collapsed within weeks,” she explains. MIDAS researchers say the risk of this happe ning with Larsen C is very real. Calving of ice shelves is a natural process—it happens to maintain the mass balance of ice sheets, says Jansen. But the current sequence of events, starting from the collapse of Larsen A in 1995, has not been seen in several thousands of years. The calving in Larsen C will shrink the size of the Antarctic landscape to the smallest humans have ever observed. While melting of floating ice shelves does not contribute much to sea level rise—ice displaces its own mass of water—there have been concerns that calving may result in increased glacial outflow into the ocean, contributing to a rise in sea levels. Scientists are, however, divided over the issue. 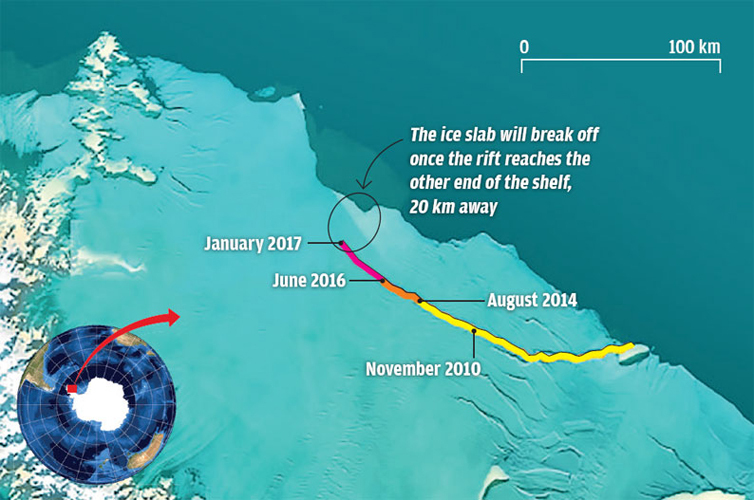 In a May 2015 study published in The Cryosphere, an inter-European group of scientists mapped the flow and velocity of Larsen B’s feeding glaciers between 1995 and 2013 during which the ice shelf had calved and then gradually disintegrated. Combining the velocity maps with estimates of ice thickness, the researchers found that the initial calving episodes on the ice shelf in 2002 led to a “near-immediate acceleration of tributary glaciers as well as of the remnant ice shelf”. Although the acceleration of the glaciers was maximum in the initial years after calving, several glaciers showed surface velocities much above their 1995 levels even 11 years after the calving episode. If one goes by this finding, the calving of Larsen C could have a devastating impact on global sea levels. The peninsular plateau, glaciers from which feed Larsen C, holds enough ice to raise the sea level by 10 cm. “The collapse of Larsen C will eventually happen. And when that happens, the glaci ers upstream of that ice shelf will accelerate to sea and raise sea levels,” says Eric Rignot, principal scientist for the Radar Science and Engineering Section at NASA’s Jet Propu lsion Laboratory. But not everyone believes this theory. A paper published in early 2016 in Nature Climate Change claims that unlike ice shelves on the Amundsen and Bellingshausen seas on the west side of Antarctic Peninsula, Larsen C ice shelf has a “large ‘passive’ frontal area, suggesting that the imminent calving of a vast tabular iceberg will be unlikely to instantly produce much dynamic change”. Johannes Fuerst from Institute of Geo graphy, the University of Erlangen Nure mberg in Germany, who was part of the study, explains: Tributary glaciers to Larsen C are situated several hundreds of kilo metres further inland. Even if the part which will break off is huge, the ice that will be removed is structurally not of much impo rtance and certainly not in terms of outflow via these glaciers. More than half of the ice shelf has to be lost before the ice front retreat can affect tributary glaciers. 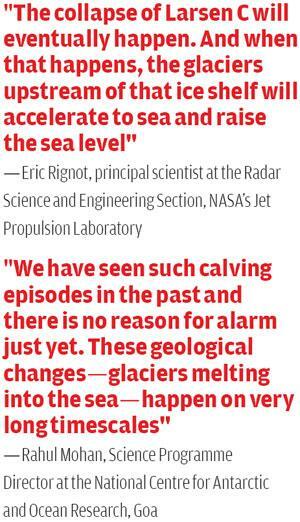 “We have seen such calving episodes in the past and there is no reason for alarm just yet,” says Rahul Mohan, Science Programme Director at the National Centre for Antarctic and Ocean Research, which is under the Ministry of Earth Sciences. “These geological changes—glaciers melting into the sea—happen on very long time-scales,” he adds. The fact that such incidents are taking place in other regions brings the critical question to the fore: is global warming to be blamed? “Some of the changes are clearly human-caused, especially the Arctic warming, sea ice loss and melting around the edges of Greenland,” says Richard Alley, professor of geosciences at Pennsylvania State University, USA. But, he adds, the situation in the Antarctic is more complicated, with clear evidence that greenhouse warming, the ozone hole and natural variability have all contributed to causing the changes. Mohan and Jansen, however, say it is unclear if the recent calving events are because of global warming. Whether or not linked to global warmi ng, studies show that frigid zones across Earth are losing ice faster than before. Around the Arctic Circle, especially close to Greenland, the sudden loss of ice has lifted the mainland and is triggering small earth-quakes in the region that has long been deemed seismically inactive (see ‘Out of the abyss’,). Warmer than usual ocean temperatures are also eroding ice sheets, which form part of the continental glacier, from below in the more resilient Eastern Antarctica. A study published in Science Advances in December 2016 states Totten Glacier, which drains a major portion of the Eastern Antarctica, has been melting from below. The findings are particularly troubling as it brings to light the crumbling resili ence of the Antarctic Ice Sheet—the largest single mass of ice on Earth. It holds about 90 per cent of the freshwater in the world that is enough to raise the global sea level by 70 metres. While it is highly unlikely that such a scenario shall unfold any time in near future, both the Poles are losing about 300 billion tonnes of ice a year, according to a 10-year study by Glaciology Centre of the Bristol University, the UK. The latest Intergovernmental Panel on Climate Change (IPCC) report, released in 2013, predicts that the global sea level will rise by 1 m by 2100. But its claims appear conservative when one takes into account the record rates of melting experienced by the Poles. A March 2016 study published in Nature shows that at the current rate of melting, Antarctica alone will raise the sea level by 1 m by the end of the century. The worst case scenario would see the sea level rise by up to 15 m by 2500. The stark picture is reminiscent of the last interglacial period some 120,000 years ago which saw the world’s oceans rise by close to 10 m. Antarctica contributed more than 70 per cent of this rise, shows a model study by researchers from the Massachusetts and Pennsylvania universities in USA. Although it is not yet known how Antar ctica will contribute to sea level rise in the current era, fears are that rapid melting in the continent in coming decades could push sea levels to rise by multiple centimetres a year instead of the current 2.6-2.9 mm. To complicate matters, experts say rapid melt off in the polar regions is likely to impact atmospheric and oceanic circulations in a major way. The Poles act as heat sinks for the rest of the planet and regulate atmospheric and oceanic flows by sequestering heat and driving winds and ocean currents. The Arctic region, where temperatures are rising faster than in temperate regions, is already seeing a weakening of jet streams (air currents). The polar vortex (large area of low pressure and cold air surrounding the Poles) has also been weakening in recent years due to warming. A similar path is now being foreseen for the South Pole. Antarctica is home to some of the highest and coldest winds observed on Earth. Scientists say thinning of its ice sheets could have a dramatic impact on Katabatic winds that form impor tant easterlies and regulate atmospheric circulation in the Southern Hemisphere. Oceanic circulation also occurs seam lessly due to atmospheric circulation and the difference in the temperature of waters close to the polar regions and tropics. The two dominant circulations of the Southern Ocean, the world’s least studied ocean, are driven by pressure differences caused by the extreme coldness in Antarctica. They stand to be altered by a sustained weakening of the icy Antarctic landscape. Alley says if melting continues to spread southward and large changes occur in the Antarctic, these could impact the circulations. But exactly how this will unfold remains a puzzle.